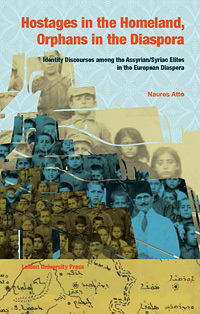 My dissertation Hostages in the Homeland, Orphans in the diaspora: Identity Discourses Among the Assyrian/Syriac Elites in the European diaspora was published by Leiden University Press (2011). In this political anthropological analysis, I discuss the present-day identity discourses among Assyrian/Syriac elites in the European diaspora. The most heated discussion during the last four decades among Assyrians/Syriacs has been what the correct name of their people should be in Western languages. Hostages in the Homeland, Orphans in the Diaspora aims to develop a deeper understanding of this name debate. The emigration of Assyrians/Syriacs from the Middle East and their settlement in Western countries dislocated their former identity discourses, which have since then entered into a transformation process and have been subsequently re-defined in relation to the new context. In this context, the name of their people has become the core element in their new identity discourses, displacing previous nodal points such as religion and language. The redefined identity discourses have also been explained as attempts to find a remedy for the Hostages and Orphans Dilemma experienced among Assyrians/Syriacs, an expression of their search and struggle for recognition and existence. In my post-doctoral research I have continued to work on related topics, such as conceptions of the homeland among Assyrians/Syriacs, the past and present discourses about the 1915 genocide, and the role which popular culture plays in the negotiation of their identity in the diaspora. In this political anthropological analysis, Naures Atto discusses the present-day identity discourses among Assyrian/Syriac elites in the European diaspora, with special attention for the community in Sweden. The most heated discussion during the last four decades among Assyrians/Syriacs has been on the issue of what the correct name of their people should be in Western languages. In this book Naures examines the modern origins of this debate and how this developed into a division within the community resulting in a better understanding of this name debate. The emigration of Assyrians/Syriacs from the Middle East and their settlement in Western countries dislocated their former identity discourses. Previous nodal points such as religion and language became less important. Their Christian identity, for example, was less unique in (post-) Christian Europe and the western languages had claimed the position of essential form of communication. As a result these characteristic cultural elements entered into a transformation process and have been subsequently re-defined in relation to the new context. In this context, however, has the name of the people become the core element in their new identity discourses. The importance of these redefined identity discourses can for example be seen when they are used to attempt to find a remedy for the Hostages and Orphans Dilemma, which is an expression among Assyrians/Syriacs of the search and struggle for recognition and existence. This book is a must-read example of a relatively young shoot on the old but blossoming tree of Syriac studies, the study of the Assyrian/Syriac migrant communities in their new environment. It is nice to know that our field keeps evolving, both with regard to its topics and with regard to the new cohorts of scholars doing that research - quite of few with cultural inside knowledge.